The FIFA 19 best trading method has to be Tech Avion Low Cost. 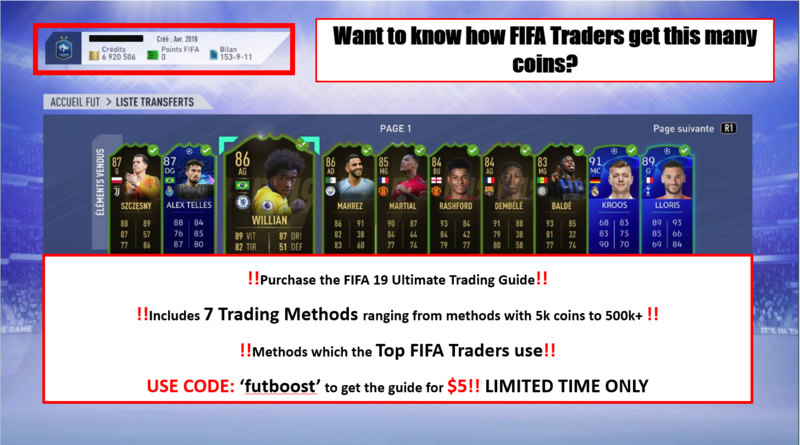 Tech Avion Low Cost is a fifa 19 trading method of where you buyer players for their lowest buy now. Apply 99 contracts and fitness, and list for a higher price for the lazy buyers. This method has worked since the earlier years of FUT 12 and FUT 13. The method i capable of earning 200k+ a day depending on how many hours you want to put into doing it. Personally I have made 200k+ a day on FIFA 18 and FIFA 19 by putting in around 4 hours of effort. The good thing about this method is that you don’t need to put the 4 hours in all in one go. You can do the method till you have a full tradepile and then once a few have sold go on again during the day to buy more players to top up your tradepile. See a couple Reviews from people who love the guide!